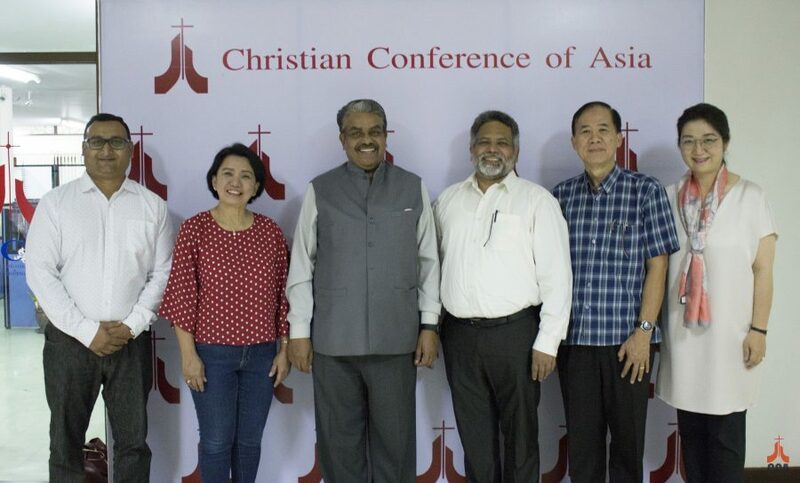 The Association of the Christian Institutes for Social Concerns in Asia (ACISCA) Executive Committee decided to streamline its activities and priorities with an aim to revitalize the organization and accompany its member institutes in respective areas of their work. The ACISCA executive committee meeting held at the headquarters of the Christian Conference of Asia (CCA) and hosted by CCA from 19-20 March, 2019 discussed a strategic programme plan to revive the activities of ACISCA and re-build ecumenical solidarity and partnership among the members of ACISCA in collaboration with CCA. The executive committee reiterated its intension of seeking more active collaboration with CCA to revitalize the ACISCA in future and recalled the ecumenical journey in the field of lay training in Asia through the work of the East Asia Christian Conference (EACC), the forerunner of CCA, and the initiative of the founding of ACISCA at EACC sponsored consultations in Perth, Australia in 1969 as well as at the OISO Academy House, Japan in 1970. Ms. Nancy Caluya, President and Fr. Dr. Mathew Chandrankunnel, Secretary of the ACISCA presented the proposed plan of actions for future programmes and priorities and they emphasized the need for staff capacity building in ACISCA member institutes. Dr. Mathews George Chunakara, General Secretary of CCA said that the CCA leadership was mandated to initiate joint ecumenical programmes together with other ecumenical organisations and institutions in Asia as part of ‘Collaborative Ecumenical Partnership in Programmes and Activities’ (CEPPA). “CCA will be supportive to strengthen ACISCA to make a qualitative difference, and both CCA and ACISCA could work in an ecumenical spirit of mutual accountability”, assured CCA General Secretary in his response to the request of the ACISCA leadership. “Revitalisation of the ecumenical movement in Asia is a priority of CCA, and collaborative programme initiatives and joint actions are primary needs to strengthen the ecumenical movement. Compartmentalization of ecumenical activities in Asia these days by different groups and organisations only add more and more fragmentation in our common witness; joint ecumenical initiatives of ecumenical organisations and institutions will add more value”, further stated Dr. Mathews George Chunakara. ACISCA and CCA will be engaged in joint ecumenical formation and leadership development training programmes in the future. Programme staff of ACISCA member institutes will be selected to attend the moth-long annual Asian Ecumenical Institute (AEI) of CCA which trains prospective ecumenical leaders. The executive committee decided to commemorate the Golden Jubilee of ACISCA in conjunction with the 15th General Assembly of CCA which will be held in 2020. The Golden Jubilee commemorative event in 2020 will include historical reflections of ACISCA members’ ecumenical journey and witness in different Asian countries over the past fifty years, recognise the contributions and services of former ACISCA leaders and introduce the ongoing work and ecumenical witness of all active members of ACISCA. The fifty years of ACISCA’s history also will be released during the anniversary. ACISCA membership includes 55 ecumenical lay leadership training institutes and programme centres dealing with Christian witness and social concerns in different parts of Asia. The ACISCA leaders pointed out that several ACISCA member bodies were not as active at present as they faced leadership crisis or lack of financial and human resources to manage the institutions and their activities. The members of the Executive Committee constituted at the ACISCA General Assembly in August 2018 are Ms. Nancy Caluya, Philippines (President), Fr. Dr. Mathew Chandrankunnel, India (Secretary), Mr. Surakit Kamonrat, Thailand (Treasurer), Mr. Sandesh Sudhakar, India, and Rev. Grace Moon, CCA (Ex-Officio).